The early road to Boston’s food truck scene was littered with speed bumps and orange cones. From established restaurants worried about competition, to the bureaucracy of licensing, early food truck owners needed equal measures of chutzpah and mustard to champion a new way to feed Boston. Back in 2008, the public was hungry, the hungry were mobile, and the mobile were tweeting. Kogi BBQ had just hit the west coast and Twitter simultaneously, taking advantage of these two huge trends. Here in Boston, then-mayor Thomas Menino got a taste of some early advocates’ food and created the first “Food Truck Challenge” to gauge response. Patrick Lynch and Ali Fong, the husband-and-wife team behind Bon Me entered on a whim, and won. Boston food truck history was launched with bold, fresh, and fun Vietnamese cuisine. Bon Me started as one truck, expanding to five, plus two restaurants. “Fueled by the desire to make high quality, affordable food accessible to the people of Boston and beyond,” they’ll be one of the premier vendors in the Boston Public Market, which opened July 30. From an initial group of about a dozen trucks, Boston now boasts a fleet of food trucks in the neighborhood of 50-60. And a handful are likely to be in your neighborhood on any given day. The City even has a food truck locator page. Bon Me, Mei Mei Street Kitchen, The Chicken and Rice Guys, and The Coffee Trike all faced some of the same challenges as their businesses grew. Food trucks generally utilize a shared commissary. That means shared storage, shared oven time, shared kitchen time to prepare the foods that get finished and served on the trucks. As the food trucks got more popular, adding additional trucks to serve more locations, it quickly became unmanageable. “With brick and mortars, we don't have to worry about if someone's parked in our vending spot (which happens more often than not! ), or if there are street closures or events. That stuff definitely keeps it interesting in our food truck realm though,” said Jennifer Ngo, human resources and marketing manager at Bon Me. Even “San” (Alessandro), owner of The Coffee Trike, found the popularity of his coffee exceeded what he could do as a solo barista. Each of these entrepreneurs found growth in their business, leading them on a search to serve more people, in more ways. Having greater creativity that comes from your own kitchen operation, being able to offer seated service, and adding beer or wine to the menu, were some of the natural progressions that led them to seek physical space. Our entrepreneurs noted the expense of the food truck, relative to opening a restaurant, made entry into this business more feasible initially. Imagine going to an investor and saying, “we want to open a Chinese American restaurant but we won’t serve rice because we can’t source it locally.” When seeking traditional financing, quirky principles and free community meals may not be attractive. When operating a food truck, these values can be real differentiators. After establishing loyal clientele based on these unique qualities, the success of these businesses made them much more attractive to investors who might otherwise have looked askance at the concepts for a traditional storefront, especially coming from totally untested concepts. Damien Yee of The Chicken and Rice Guys describes their business as “approachable food truck delivering delicious food with great service.” And the CNR Guys as they’re known, have a broad view of “service”; in fact, Yee was hired in large part because of his background in serving the underserved in Latin America. He’s proud of the milestones the CNR Guys have achieved here in Boston including over 1,800 plates served at The Women’s Lunch Place since 2013, among others. “Service” and “Community” both take on broader meaning for Bellino. 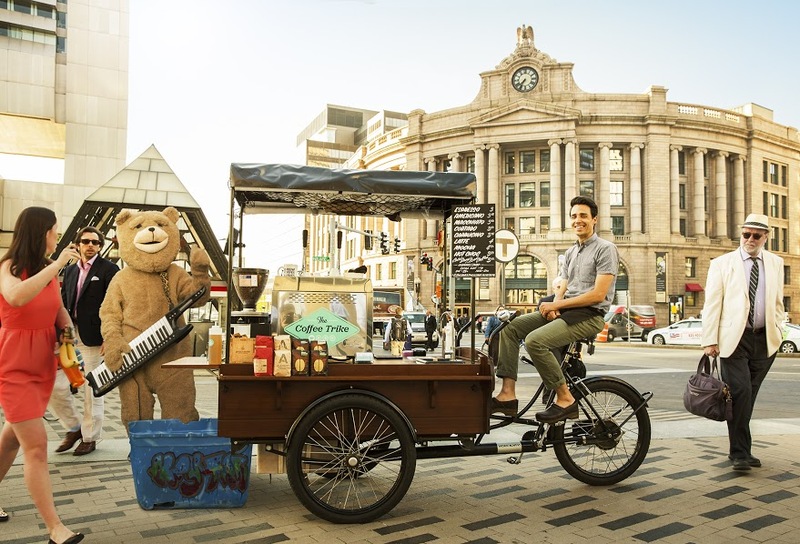 The Coffee Trike was named in Business Insider’s "50 Coolest Small Businesses in America," and is a 2013 Zagat Boston "30 Under 30" Honoree. Having studied music at Berklee, he knows the city and chose his neighborhood with care. In working with Graffito SP, and setting up shop in Boston’s Historic Leather District, San was very much persuaded both by the location and the sense of community. Graffito SP is an unusual real estate developer with a core focus on community growth and “urban placemaking.” The chance to be a part of that and to provide a broader menu to more people, as well as to provide jobs for professionals, were all part of his decision to set up shop in the historic Leather District. Just as Choi on the west coast benefited from the start of Twitter as he launched Kogi, Mei Mei Street Kitchen leveraged social media to fund their next growth, broadening and deepening their connection to fans and followers through a Kickstarter campaign. Each of the businesses continues to rely on Twitter and other social media to alert customers to locations, specials, closures, and events. At least in Boston, Social Media and Food Trucks are twin trends that have grown up together. What’s your favorite food truck? What about their restaurant spaces?